But 'wood' you buy one? 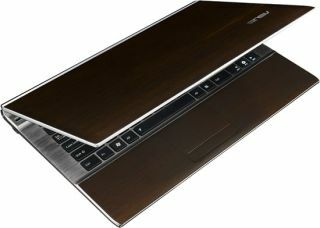 Asus has officially launched its U33/U53 bamboo laptops in the UK, pitching the new range at the green consumer. The laptop giant's bamboo notebooks were shown off at CES 2010, but have now finally arrived in the UK. "Green living is an ideal. An aspiration. Above all, a choice," emotes Asus. "As part of Asus' continued innovation in the area of environmental sustainability, the new U33/U53 Bamboo Series is manufactured using environmentally-friendly bamboo." The Asus U33/U53 laptops boast USB 3.0 connectivity, plus Super Hybrid Engine and Nvidia's Optimus to make sure your power usage is monitored. The Asus U33 is a 13.3 inch laptop, whilst the Asus U53 is a 15.6 inch version. Both have a 1366x768 resolution screen, Intel Core i5 processors, Windows 7 Home Premium Nvidia graphics cards and seamless 'chiclet' keyboards. "The notebook exterior is encased in a natural smoky bamboo material – reducing traditional plastic use by around 15% and exuding organic appeal through both appearance and touch," adds Asus. "Even the outer packaging is stylishly green; the wrapped gift box made from 100% recyclable bamboo materials provides a thoughtful finishing touch."